Rosalyn Yoon is an illustrator based in Pittsburgh, Pennsylvania. As a lover of travel and her “red-bearded Mister” Trevor, she often documents her life through illustration. 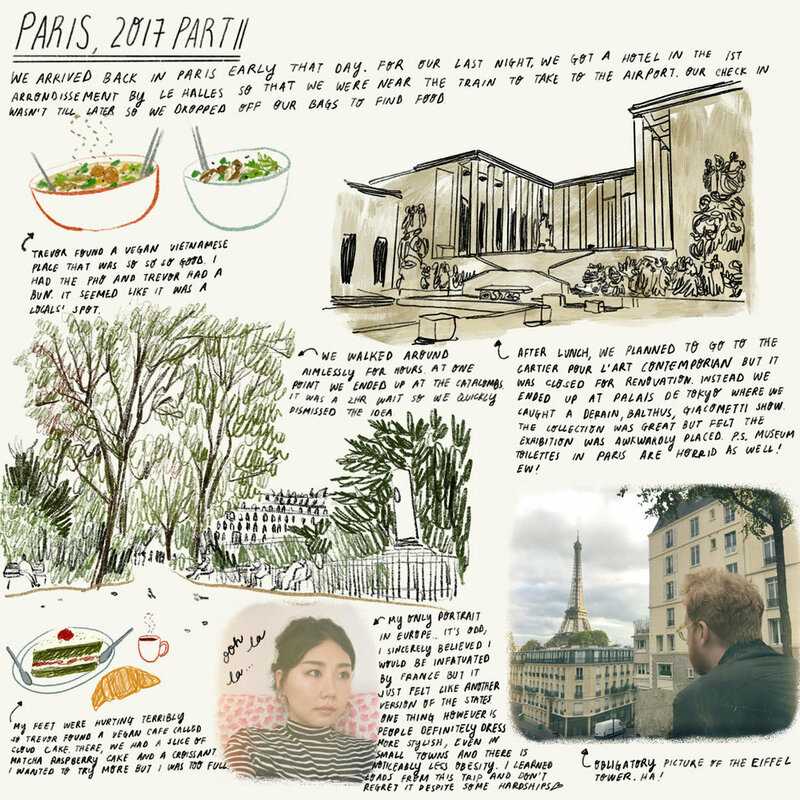 With wonderful travel journals and doodles about her adorable relationship, Rosalyn’s work is bound to make your heart feel a little bit warmer. One thing that we can pinpoint from your charming illustrations are your cute endeavours with your husband Trevor! Your travel diaries are awesome; with a mix of both illustration and photographic material they make a great little read. What got you into recording your exciting trips and how do you go about creating the journal pages? Thank you! This was my first time in Europe, so I thought I would commemorate the experience through illustrations. I saw sites I never could have imagined. It was fascinating seeing life in other countries –primarily how people live, how they dress, and what they eat. I wanted to enjoy the trip as much as I could and we spent most days wandering aimlessly about. At the end of each day, I'd look at the pictures I took with my phone and create a journal entry based on what I experienced that day. The whole journaling process is pretty organic without intent. My journal entries are the visualizations of each day's memories and thoughts. What was the most interesting place to visit on your trip, and did you get any new creative inspiration from your travels? 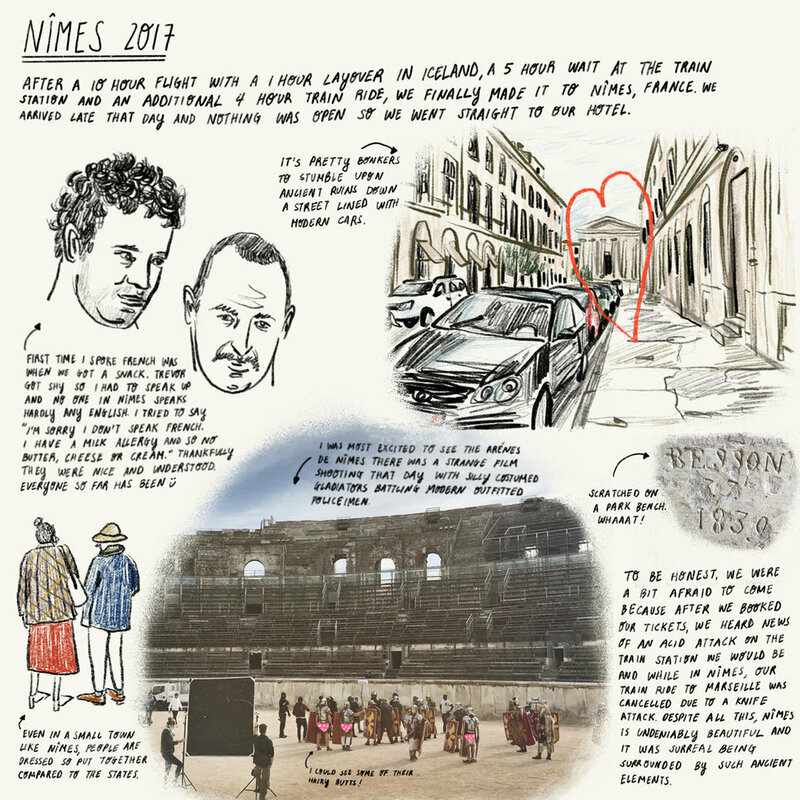 We visited Nimes, Marseilles, Paris, Brussels, and Venice. Out of all of them, I would have to say Brussels. We were only there for a short time, but I love how different Brussels seems from anyplace in the States. A lot of the areas we walked around seemed straight out of a fairy-tale, with historical buildings in pastel hues and hilly cobbled streets. I feel this trip definitely influenced my color palette, lines, and even down to the clothes I draw on my character illustrations. Other than your travel journals, sweet illustrations of you and Trevor are scattered all over your Instagram feed. 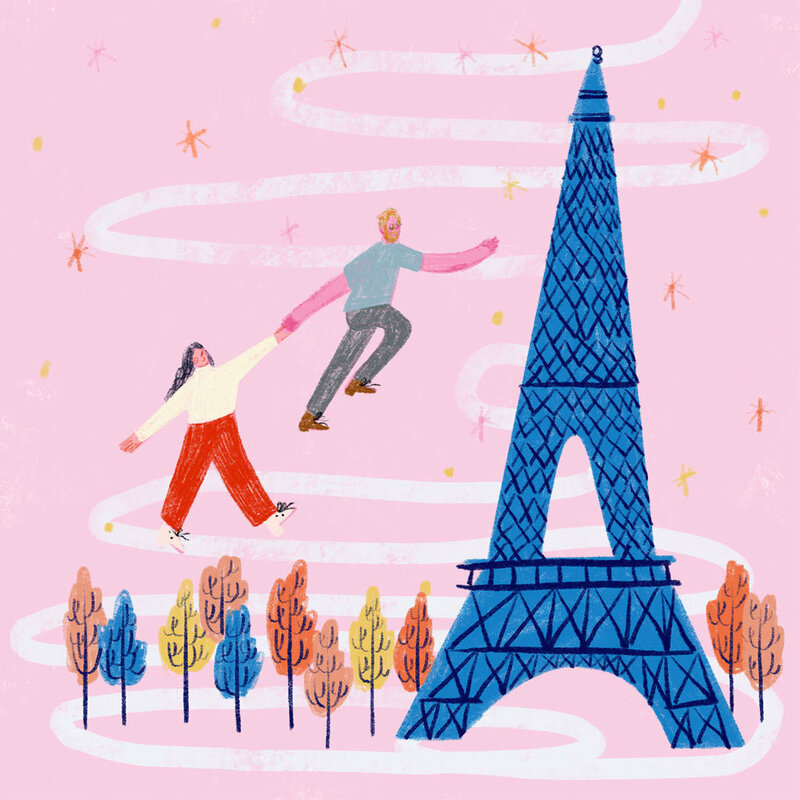 (The Eiffel tower piece is so cute!) Would you say that depicting your life together something that you enjoy the most? Thank you! My favorite person in the world is Trevor Neil Williams and he undeniably inspires my creativity. Often times, I enjoy illustrating our days spent together. I communicate my feelings through art, and at the beginning of our relationship, I sort of started this tradition where every year for Trevor's birthday, I make him a mini sketchbook of us. I guess in a way, it spiralled from there. When it comes to recording your life adventures, what forms of media and material do you tend to work with? And what is a process that you would like to experiment with in the future?! I recently transitioned into digital art and have been creating most of my illustrations with my iPad and Apple Pencil. I like the convenience because I can take it anywhere to draw and it also gives me freedom to experiment with different techniques without worrying about starting over. With digital art, I can work in layers and I can go back and change things much easier without scratching the entire piece sometimes. A process I'd like to experiment with is perhaps ceramics. I took a mandatory sculpture course in school, but it was just a small sampling compared to what I would like to explore given the chance. For readers that want to start piecing together their own journals, what 3 items/materials would you suggest they begin with? When I illustrated my travels, I used my iPad and Apple Pencil, but if you don't have those items, I'd simply just recommend a sketchbook and color pencils. Also a camera or just your phone camera to take lots of photos for reference. I'd suggest taking pictures of your favorite sites, activities, food, or even your favorite outfits on strangers. I love the general fashion sense in Europe! One final and fun question! What is your favourite creative piece to date? That's really difficult because I have fun making all of them! If I didn't, I'd start over. But my favorite things to draw are most definitely food, clothes and my cats. You can follow Rosalyn on Instagram @rosalynyoon and check out her portfolio at rosalynyoon.com! If you’re a creative with something to share, don’t hesitate to get in touch! Check out our ‘contact’ page for more information!